The British Motor Corporation Limited (BMC) was a UK-based vehicle manufacturer, formed in early 1952 to give effect to an agreed merger of the Morris and Austin businesses. BMC acquired the shares in Morris Motors and the Austin Motor Company. Morris Motors, the holding company of the productive businesses of the Nuffield Organisation, owned MG, Riley, and Wolseley. The agreed exchange of shares in Morris or Austin for shares in the new holding company, BMC, became effective in mid-April 1952. In September 1965, BMC took control of its major supplier of bodies, Pressed Steel, acquiring Jaguar's body supplier in the process. In September 1966, BMC merged with Jaguar Cars. In December 1966, BMC changed its name to British Motor Holdings Limited (BMH). BMH merged in May 1968 with Leyland Motor Corporation Limited, which made trucks and buses owned Standard-Triumph International Limited, BMH becoming the major part of British Leyland Motor Corporation. The Mini was BMC's all-time best seller. BMC was the largest British car company of its day, with (in 1952) 39% of British output, producing a wide range of cars under brand names including Austin, Morris, MG, Austin-Healey, Riley, and Wolseley, as well as commercial vehicles and agricultural tractors. The first chairman was Lord Nuffield (William Morris), but he was replaced at the end of 1952 by Austin's Leonard Lord, who continued in that role until his 65th birthday in 1961, but handing over, in theory at least, the managing director responsibilities to his deputy George Harriman in 1956. BMC's headquarters were at the Austin Longbridge plant, near Birmingham and Austin was the dominant partner in the group mainly because of the chairman. The use of Morris engine designs was dropped within three years and all new car designs were coded ADO from "Amalgamated Drawing Office". The Longbridge plant was up to date, having been thoroughly modernised in 1951, and compared very favourably with Nuffield's 16 different and often old-fashioned factories scattered over the Midlands. Austin's management systems, however, especially cost control and marketing, were not as good as Nuffield's and as the market changed from a shortage of cars to competition, this was to tell. 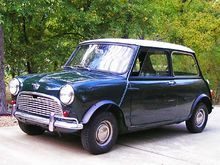 The biggest-selling car, the Mini, was famously analysed by Ford Motor Company, which concluded that BMC must have been losing £30 on every one sold. The result was that although volumes held up well throughout the BMC era, market share fell as did profitability and hence investment in new models, triggering the 1966 merger with Jaguar Cars to form British Motor Holdings (BMH), and the government-sponsored merger of BMH with Leyland Motor Corporation in 1968. At the time of the mergers, a well established dealership network was in place for each of the marques. Among the car-buying British public was a tendency of loyalty to a particular marque and marques appealed to different market segments. This meant that marques competed against each other in some areas, though some marques had a larger range than others. The Riley and Wolseley models were selling in very small numbers. Styling was also getting distinctly old-fashioned and this caused Leonard Lord, in an unusual move for him, to call upon the services of an external stylist. In 1958, BMC hired Battista Farina to redesign its entire car line. This resulted in the creation of three "Farina" saloons, each of which was badge-engineered to fit the various BMC car lines. The compact Farina model bowed in 1958 with the Austin A40 Farina. This is considered by many to be the first mass-produced hatchback car: a small estate version was produced with a horizontally split tailgate, its size and configuration would today be considered that of a small hatchback. A Mark II A40 Farina appeared in 1961 and was produced through 1967. These small cars used the A-Series engine. The mid-sized Farinas were launched in 1958 with the Wolseley 15/60. Other members of the group included the Riley 4/68, Austin A55 Cambridge Mk. II, MG Magnette Mk. III, and Morris Oxford V. Later, the design was licensed in Argentina and produced as the Siam Di Tella 1500, Traveller station wagon and Argenta pick-up. The mid-size cars used the B-Series straight-4 engine. Most of these cars lasted until 1961, though the Di Tellas remained until 1966. They were replaced with a new Farina body style and most were renamed. These were the Austin A60 Cambridge, MG Magnette Mk. IV, Morris Oxford VI, Riley 4/72, and Wolseley 16/60 and in 1964 the Siam Magnette 1622 alongside the Siam Di Tella in Argentina. These mostly remained in production until 1968, with no rear-wheel drive replacement produced. Most BMC projects followed the earlier Austin practice of describing vehicles with an 'ADO' number (which stood for 'Austin Design Office' but after the merger 'Amalgamated Drawing Office'). Hence, cars that had more than one marque name (e.g. Morris Mini Minor and Austin Mini) would have the same ADO number. Given the often complex badge-engineering that BMC undertook, it is common amongst enthusiasts to use the ADO number when referring to vehicles which were a single design (for example, saying 'The ADO15 entered production in 1959'- this encompasses the fact that when launched, the ADO15 was marketed as the Morris Mini Minor and, later, the Austin Seven—soon replaced with Austin Mini). The ADO numbering system did continue for some time after the creation of British Leyland - notable models being the Austin Allegro (ADO67) and the prototype version of the Austin Metro (ADO88). Most BMC-era commercial vehicles were sold as Morris, but there were sometimes Austin equivalents. Radiator badges on the larger vehicles were often BMC. With the merger of the Nuffield and Austin interests, the Nuffield Organisation's tractor range, the Nuffield Universal, was incorporated into BMC. In the 1950s and the 1960s, BMC set up 21 plants overseas, some as subsidiaries, and some as joint ventures, to assemble its vehicles. One was British Motor Corporation (Australia) which was established in 1953 at the Nuffield Australia site on the one-time Victoria Park Racecourse, Sydney. This facility went from a marshalling area for fully imported Morris cars (Austins were up until then being assembled in Melbourne from an earlier Austin Motors establishment), to a facility for making CKD cars, to the total local fabrication and construction of vehicles, engines, and mechanicals. Denmark was a particularly strong market for BMC products in Europe. In the postwar period, the Danish government closely regulated exports and imports to maintain the country's balance of trade. High-value imports such as cars were heavily taxed. Britain bought large amounts of agricultural and meat produce from Denmark, and in response, British cars were subject to a much lower import tax than cars from other countries, making BMC products very popular in the country until the 1970s, when these regulations were relaxed. From 1963 to 1975, a company was established in Spain to produce BMC cars under licence, its name was: 'AUTHI' -'Automoviles de Turismo Hispano-Ingleses' -'Spanish-English Tourism Automobiles'. The factory was in Pamplona, Navarra, Spain, and when the production of Austin and Mini cars was discontinued, Sociedad Española de Automóviles de Turismo (SEAT), owned by the state and some banks and industrial investors, purchased the factory. After the takeover of SEAT by Volkswagen, SEAT made an 'internal' resale of the Pamplona factory, formerly Authi, to Volkswagen, which soon started producing there the 'Polo'. The Wilson Labour government (1964–1970) came to power at a time when British manufacturing industry was in decline and decided that the remedy was to promote more mergers, particularly in the motor industry. Chrysler was already buying into the Rootes Group, Leyland Motors had acquired Standard Triumph in 1961 (and would buy Rover in 1967) and had become a major automotive force. BMC was suffering a dramatic drop in its share of the home market. Tony Benn, appointed Minister of Technology in July 1966, brought pressure to bear on the industry. In mid-1965 BMC offered to buy its major supplier Pressed Steel and took control in September with 27,000 employees. Twelve months later, BMC merged with Jaguar Cars adding a further 7,000 employees. On 14 December 1966 BMC shareholders approved the change of its name to British Motor Holdings (BMH) and it took effect from that date. Little more than 12 months later in January 1968, under pressure from the Labour British Government and Minister of Technology Tony Benn, a further wave of mergers occurred in the British car industry. BMH merged with the Leyland Motor Corporation (LMC) to form the British Leyland Motor Corporation (BLMC). In August 1975 BLMC was partly nationalised and renamed British Leyland Limited. Within the new conglomerate, the various marques were grouped together into two main divisions, based largely on the original BMC and LMC businesses; with the former mass market BMC marques becoming part of the Austin-Morris division of BLMC, whilst LMC stablemates Rover and Triumph became part of the Specialist Division, of which Jaguar was also officially part. This grouping essentially existed until Jaguar regained its independence in 1984 and all of the surviving BL marques were consolidated into the Austin Rover Group. Following the merger with Leyland, a review of company records undertaken with the support of the new board, author Graham Turner stated that at the time of the merger, 16 versions of the Mini were being produced, yielding an average profit of just £16 per car, while every Morris Minor sold lost the group £9 and every Austin Westminster sold lost £17. This helps to explain why the Westminster and Minor were among the early casualties of the merger, as well as the introduction of the Mini Clubman, capable of being built for less, but sold for more than a standard Mini thanks to simplified ("modernised") front panels. Even the UK's best seller, the Austin/Morris 1100, had to be subjected to an emergency cost-reduction programme which removed about £10 from the cost of each car, applying changes that included the omission of lead sealing from body joints (£2.40 per car), removing provision for optional reversing lamps (£0.10) and "changes in body finish" (£0.75). Rebuilding the Cowley plant to include "new automated body building facilities" saved £2.00 in transport costs per car for bodies that no longer needed to be transported from the corporation's Swindon plant and in the longer term further transport costs were saved by concentrating assembly of the model at a single plant, rather than splitting it between plants at Cowley and Longbridge. Because of the high proportion of auto-production costs represented by fixed costs that needed to be allocated over a planned production volume, and the use in the 1960s of investment appraisal criteria that were ill-suited to accounting for volume fluctuations and the rapidly changing value of the UK currency in the 1960s, the precise figures quoted may be open to challenge, but the new management's diagnosis that BMC's profitability was insufficient to fund support and new model investment to cover its disparate range of brands and models was hard to refute. In 2002, BMC (Turkey), a Turkish commercial vehicle builder, originally set up by the British Motor Corporation to build its designs under licence in the 1950s, began exporting its vehicles to Britain. This allowed the return of the BMC brand to British roads for the first time in over 40 years. ^ "Lord Nuffield's Retirement". The Times (52498). 18 December 1952. p. 6. ^ "New Dormobiles". Autocar. Vol. 127 (nbr 3739). 12 October 1967. pp. 91–92. ^ Timothy R. Whisler (1999). The British Motor Industry 1945–1994. Oxford University Press. ISBN 0-19-829074-8. ^ a b c "The cars then and now". Autocar. 28 October 1971. p. 57. Wikimedia Commons has media related to BMC vehicles.